This Beko Built-in Double Oven comes with a variety of helpful features and programmes to suit all your cooking and baking needs. With an AA energy rating, it helps keep your energy bills down too. There’s also a second 38 litre cavity that can be used as a conventional oven or grill. It’s effortless to keep both cavities clean thanks to their smooth enamel lining, which wipes clean with ease. Great for when you’re preparing your food ahead of time, you can set the easy-to-use touch screen LED display to begin cooking at a time that’s convenient to you – up to 24 hours in advance. 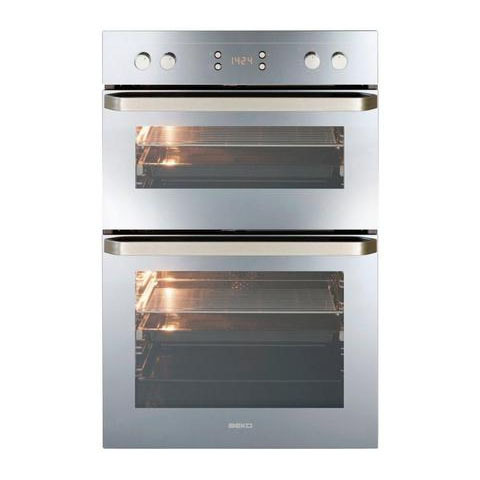 Always achieve perfectly roasted meat and evenly baked desserts with True Fan Cooking in this Beko. The heating element surrounding the fan offers uniform heat throughout the oven for perfect, quick and even cooking results.